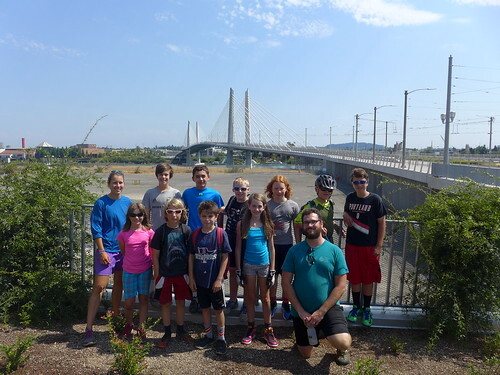 Our Bike Camp Middle Schoolers are very interested in all things Tilikum Crossing, Portland’s newest bridge in 40 years. At more than 1,700 feet in length, the Tilikum Crossing is the only bridge of its kind in the U.S. designed to only carry light rail trains, buses, streetcars, bicyclists, and pedestrians. 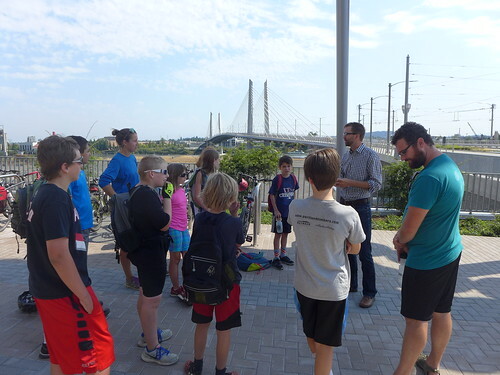 Yesterday, the Campers participated in a behind-the-scenes interview with TriMet Active Transportation Planner, Jeff Owen, and received answers to all of their burning questions – and more. Do you know why it’s not possible to build a water park in the lot adjacent to the new bridge? Find out in their interview below. BIKE CAMPER: How many times a day do they have to do these tests with the light rail? JEFF: They have to test all of the signals and they have to train all of the operators. Every operator in the system who may be assigned to this route has to get trained on it. It’s not quite the frequency that would be normal conditions but it’s almost as much. On August 30th, in just a few more weeks, we’re going to start what is called Simulated Revenue Service. What that means is that trains and buses are actually going to run as if they are as frequent as it is going to be on opening day. September 12th is opening day where all the trains start their regular routes and frequencies. We’re going to start that a little bit sooner and that helps us take care of any issues that may come up. BIKE CAMPER: So instead of building a building there [in the empty lot next to Tilkum Crossing], could we just make a roller coaster that goes across the river? JEFF: That would be really cool, but I don’t think it will happen. BIKE CAMPER: There could be a water park and under it the TriMet residential office building and on top of it is a water park so it goes over the bridge. JEFF: But not a water slide into the river? Big ideas are really fun and it all comes down to who owns the land and what the city allows to happen there. Some of these ideas are really fun and would be awesome, but they may not happen. What we’re probably going to see are more buildings that are associated with office space. OHSU owns a lot of this land so it might be health and science related. BIKE CAMP INSTRUCTOR: Last time we saw you, you mentioned they were installing a counter. Did they count the people that went over on Sunday? JEFF: Yes, we did install counters that only count bikes. I’ve been at TriMet for 3 years. As soon as I started, I asked that question. Have any of you been over the Hawthorne bridge and you’ve crossed it and seen the numbers change? We installed a very similar product to that. When you bike over, you can look up and see what number you are for that day. When I began working at TriMet, I started asking if we were going to do that on this bridge and nobody had thought about it or wanted to. I kept asking and making the case for it and that’s one thing I’m really proud of is that I was able to make that happen. We were able to find counters and put them on the bridge and install them. They were on during Bridge Pedal. They work by detecting metal that goes over the top. BIKE CAMPER: What about wheelchairs? JEFF: Wheelchairs would not be counted. It depends on speed and other factors. BIKE CAMPER: What if it’s an electric wheelchair? JEFF: I’m not sure, we’re going to have to test it! In order to keep doing a lot of this new infrastructure, we’re trying to tell a story about why we need more bike lanes and more sidewalks. We’re trying to get more data because a lot of the people who make really big decisions about building really big infrastructure that cars travel on, they build it and they base it on data. We’re trying to get more of that data about how many people ride bikes and how many people walk. These counters are going to help a little bit to try and tell that story. All the data that is collected is going to go on a public website so you can go home, get online and pull up a website, just like you can for the Hawthorne Bridge. BIKE CAMPER: It was 22,000 when I crossed the Tilkum on Bridge Pedal! JEFF: That’s a lot! One thing that we’re still doing is trying to test and see if what was detected is actually accurate. We’re still making some adjustments. BIKE CAMPER: Will TriMet or ODOT or whatever agency is responsible, will they build another highway that is going out to Hillsboro? JEFF: A lot of different agencies have different priorities. TriMet, for example, we don’t really want any more car bridges because there’s a lot already. We want more options for taking trains and buses, and biking and walking. But we also have to work with all of our partners to see what’s best for the whole region. There could be something that still occurs in the future that’s another highway or another means to get around in a car. But collectively there’s a lot of interest in the region to not really do that because we’ve done a whole lot of that for many generations now. BIKE CAMPER: In rush hour, when I go to soccer practice, sometimes it takes an hour to go 15 miles. JEFF: One thing that happens in the transportation world is this term called induced demand. When you build more highways, they are very likely to fill up and also get clogged because that encourages more people to go ahead and buy the car and use it. It will just fill up again and they’ll have to do it again forever. We’re trying to keep the people who drive in cars at about the same level, and increase other areas like biking, walking, and transit. BIKE CAMPER: You would need to make the incentive to bike or walk higher than the incentive to drive. JEFF: Exactly! I think that you all have very bright futures in transportation planning and engineering! BIKE CAMPER: If you made the incentive for people to bike higher, then there would be less people in rush hour, and then it would be easier to go to soccer practice. JEFF: Exactly. You’re wearing a backpack, right? And you’re using a water bottle and sunglasses. All of that stuff has to come from some place. And it comes eventually on a freight train or truck. The more that we can get people to ride a bike, walk, and take the train or bus, that means you’re not going to be in a car on the roadway system. That place is then freed up for things like freight vehicles, trucks, and trains to get goods and services to different places quicker. BIKE CAMPER: Will you build another bridge of transit if this city gets bigger? JEFF: That’s a good question. Probably at some point in the future we will. One thing that’s probably likely to happen before a completely new bridge gets built is something like the Steel Bridge that the Max goes over already near the Lloyd Center. That bridge is really old and so it starts to have problems where we have to go and make little repairs. Something like the Steel Bridge probably needs to be replaced in the future. There’s not currently a project that we know of where we’re trying to build another bridge just for transit, but probably in the future there will be a need for it. BIKE CAMPER: How do you make the bridge change colors? JEFF: Good question. Every one of those white cables has little lights that are going to shine on them. They’re going to change colors very slowly and it’s based on the flow of the river and the height of the water. On the Morrison Bridge, a few bridges down, there’s this detector system that another agency installed to monitor the flow of the river and the level. Thank you, Jeff, for sharing your knowledge and enthusiasm with our Bike Campers. 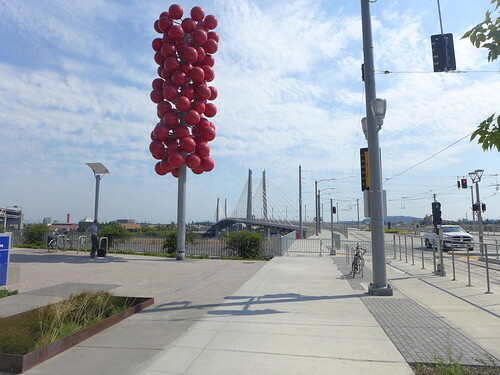 Tilikum Crossing officially opens on September 12th, but come out early for a celebration on August 22nd, featuring a fireworks show on top of bridge.